What? Another challenge? But you never finished this one! No, I didn't. My father had to have brain surgery and has been in the ICU for over 2 weeks now. My extra writing time has been sucked up by trips to the hospital, conversations with the doctors, and updating family and friends. I've also been dealing with things with my mother who has Alzheimer's. April has been a long, difficult month. But I vow to finish the blog posts for the original challenge and THEN I will think about working on this one. If not, please be assured that I will continue to update with books I have read and enjoyed, as well as a few that I didn't. When I was a kid, I wanted to try to read the entire encyclopedia series, so that I could learn a little bit about everything. Granted, our set of encyclopedias was by Funk & Wagnells, and we picked up each volume at the grocery store over half a year. Instead of reading my way from A to Z, I would pick topics to "study" over the summers. Yes, I was one of those nerdy kids who could never get enough of learning. I am also a Montessori kid, so I know how to study on my own. Imagine my delight upon finding out that someone actually did make it all the way through the alphabet. A. J. Jacobs not only read all of his encyclopedias, but he did so with Britannica, AND he wrote a memoir about it. My sister has read the book, and she recommended it to me. I do own a copy, because I found it on the 3 for 2 table at Borders. I am ashamed to say that I haven't yet finished it. But it is on my reading list for this summer and I can't wait to finish it! If you know me at all, you know that I am a huge fan of the Showtime series Dexter. I watch it regularly during the season, watch repeats during the off season, and I own every DVD out there. I watched the entire first season when I was home sick with the stomach flu, just before the second season started. I was ecstatic to then find out that it had been based on a book series by Jeff Lindsay. I stumbled upon the paperbacks when I was perusing my local Borders store. At that point, only the first two were available. I bought them both and easily devoured them within a few days. The Showtime series very closely parallels these two books, Darkly Dreaming Dexter and Dearly Devoted Dexter. There are a few major differences, which I will not share with you, should you decide to read them. Starting with the third book, Dexter in the Dark, the TV series and the book series take a massive departure from each other. Usually I get annoyed when TV and movies take their own path along a story's trajectory and differ so much from the book series. But with Dexter, it somehow makes it more fun for me. It is as if the two Dexters are in parallel universes. Each one has its own intrigue and dark side. I love to compare and contrast the two. The third book, Dexter in the Dark is probably my least favorite. It reminds me more of a Stephen King story as it focuses on the monster known as the Dark Passenger. I love Stephen King, but that style just didn't work in this series. The fourth book, Dexter By Design, is probably my favorite. I have the fifth book, Dexter is Delicious, but I haven't yet read it. I think I have made it through the first chapter. It's not that it isn't interesting; I just haven't had a chance to read it. So, if you are feeling the need to feed your Dexter fetish, check out these books! It was a little long to get into, yet intriguing at the same time. It was the first time that anyone had tried to write a true crime story. Better yet, the author developed sympathy for the bad guys. This part really comes to light in the biographical movies about Truman Capote. I like to read classic novels and try to imagine what it would have been like reading them for the first time, back when they were originally published. In a time of crime being broadcast all over every form of media, it is difficult for us to imagine the shock value this book had. It also had a lasting impact. One of my favorite authors is Jon Krakauer, You may know him from Into Thin Air and Into the Wild. He has also looked into other famous murders and wrongful deaths, and writes about them in a captivating way. Perhaps without Capote, he would not have been able to do so. Capote was also famous for penning the story that propelled Audrey Hepburn to iconic status. His story Breakfast at Tiffany's was later turned into the classic movie, giving us the image we all know and love. Ah, the Bronte sisters. Timeless classics. I first read Jane Eyre by Charlotte Bronte in 8th grade and I enjoyed it. In 1996, I saw the theatrical interpretation of the book, starring William Hurt, Charlotte Gainesbourg, and Anna Paquin. I fell in love with the story and reread the book. I bought the movie on DVD and reread the book a few more times. A couple of years ago. PBS did their own version of Jane Eyre as a mini-series. This version, being much longer, was able to incorporate even more of the book. I thought it was excellent, and eventually procured my own copy. I still love reading the book, and have downloaded a free version to my Kindle. It is going to keep me company one of these days when I have to wait a while somewhere, or in the middle of the night when I can't sleep. I heard there is a new theatrical version coming out. I'm not sure how I feel about that. I mean, why do we have to keep redoing stuff? I guess it is to get the "younguns" interested again? I just hope it is worth it. I have a couple other Charlotte Bronte works. Once at an antique store, I picked up a copy of The Professor that also included several of Charlotte's poems. I started the story and enjoyed it. I just haven't yet gotten around to finishing it. I also enjoyed the poetry, even though I don't often read poetry, unless I am in the mood. I also recently picked up a copy of Vilette. As for Emily Bronte, she is famous for Wuthering Heights. I think I need to read it again. I remember watching the Laurence Olivier movie version of the book, and thought it was okay. Several years ago, at the urging of a good friend, I finally read the book. I didn't like it. But I can't remember now if I didn't like it because of the story, the writing, or if the characters just made me mad. I will have to give it another shot. And, of course, there is Anne Bronte, the lesser-known Bronte sister. She wrote a lot of poetry and a couple of novels. They were Agnes Gray and Tenant of Wildfell Hall.. I picked up a used copy of her poems several years ago. I have read through many of them. Again, I have to be in the mood for poetry, but she was also quite talented. I have not yet tried her novel, but I will look for it. So, yes, Jane Eyre is one of my all-time favorite books and stories. Call it ironic that I now live in Rochester. I highly recommend it, but please feel free to check out any of the books below. You can also check out some of these DVD versions of these classic books. Did you ever read V.C. Andrews? I started with them when I was either 9 or 10 years old. My cousin, who is 16 years older, had given all of her books to my mother, so that I could enjoy them as I got older. My smart parents decided to put those books away until I got older. Yet, I still managed to get my hands on Flowers in the Attic. I was completely enthralled in the book and read it over and over again. I particularly remember sitting on Saturday, reading the entire book in one day. Then, I found out there was more to the story, so I continued reading the series. I was confused by Garden of Shadows coming out last in the series, especially as it was the prequel to Flowers in the Attic. But, I didn't care. Next, I read the Heaven Leigh Casteel series. One of my favorites was the stand-alone My Sweet Audrina. I also enjoyed the Cutler series about Dawn and tried the Landry series. The Logan series was my final series. Alas, V.C. Andrews died before she could complete all of the ideas that she had created. The family wanted to maintain her legacy, so they chose to work with carefully selected authors to bring those ideas to life. Unfortunately, I could tell the difference, and I soon stopped reading. They were all too formulaic and predictable. The new authors lacked some of the magic that V.C. Andrews had. Here is the list of the books I enjoyed reading when I was younger. 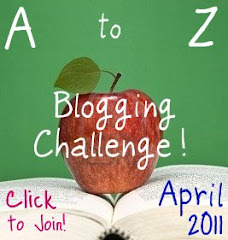 There is this fantastic challenge for the month of April, known as the A to Z challenge. The concept is, each day in April, except for Sundays, one letter of the alphabet is assigned to the day. Your job is to blog about a topic that begins with that letter. For some of my sites, this is going to be really easy. For others, such as this one, not so much. The challenge technically began yesterday. So, I am already a day behind, and scrambling to come up with ideas. I think I will be doing the same as I am doing over at Andi's Kids Books, and will just try to think of different books, series, authors, and/or characters that begin with each letter. I will talk about them, as opposed to doing a traditional review. And, I am going to include Amazon Associates widgets, to help you with your shopping. You will benefit from getting great deals on your Amazon purchases. I will benefit by you purchasing through my links, with a few pennies here and there. So, thanks in advance for your support. Happy reading!